Well hello hello it's Friday once again. We are in the midst of Operation Move and Pack and are just having the best time. So. 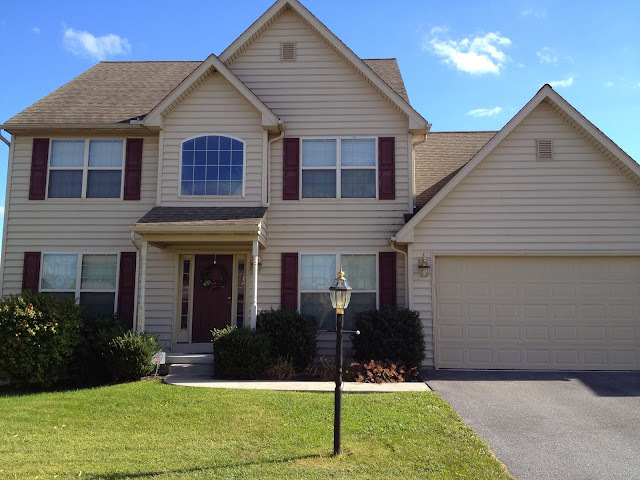 In order to motivate myself I am dreaming of our future home by staring at pictures. Pictures and plotting. I plan on doing before and after posts later when there is an after to post about but for today I am just going to give you a brief introduction into my very own bachelor pad. My own Hotel California. Which you would never guess from the outside. The future family room you see below. 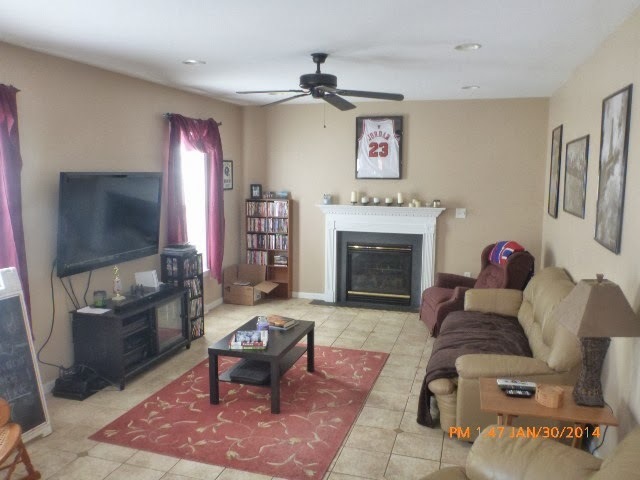 I especially enjoy the Jordan jersey above the fireplace. The Giants blanket. And the I'm sure "borrowed" sandwich sign. I do fully appreciate the window treatments and the candles adorning the fireplace. Setting the mood is what it's all about. 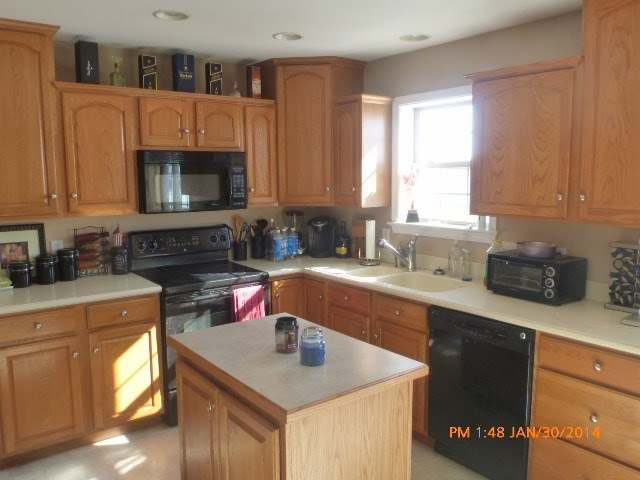 Moving on to the kitchen. Those liquor bottles and decorative boxes would certainly go nicely with my future family-friendly decor. I have nothing else to say here other than it looks pretty clean and tidy. And again with the candles. I am only including this shot because of the half naked lady on the fridge. And if you look really closely you may notice a cute little toddler in her Easter bonnet who suspiciously looks like my Letty right above her..... Ahem. Also. JGR stands for Just Get Ripped. Also code for just get hammered drunk. Coming to a store near you this Spring. 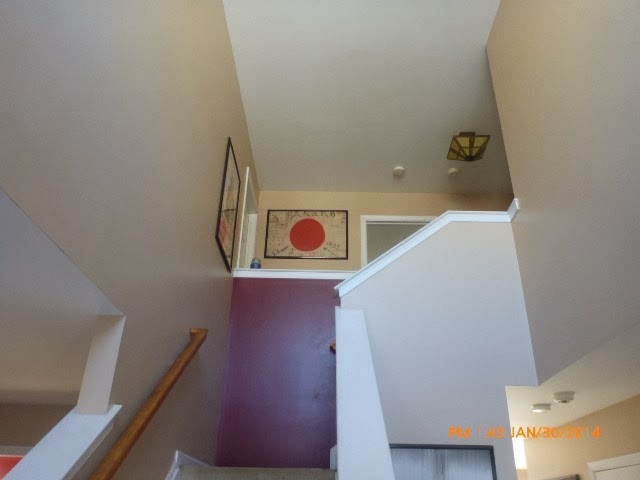 Down the hall and to the foyer and you look up the heavens and see..... a Japanese flag. I love me some WWII history, I truly do. And I also love family artifacts. I happen to know this flag was recovered during The War by the homeowner's grandfather (who happens to be my grandfather as well in case you were confused). I just don't need a constant reminder of say. A War. And that light up there is going, going... gone. Hey there. 2004 called. 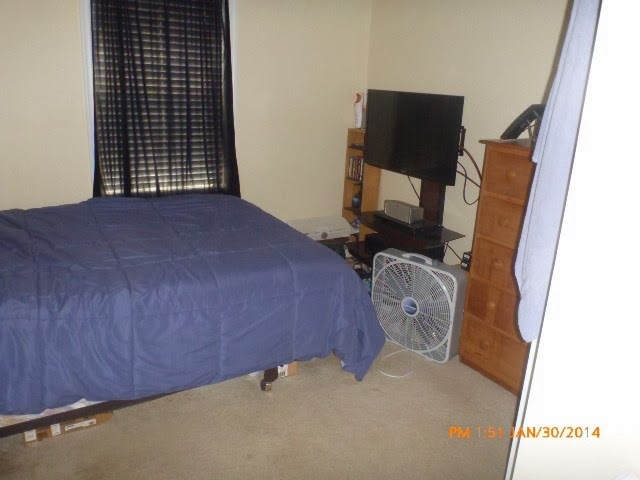 It wants it's college bedroom back. But! The bed is made. I'm thinking that's such a huge step in the right direction. I foresee a crib being installed here in the very near future. And no floor fan. This is the office. 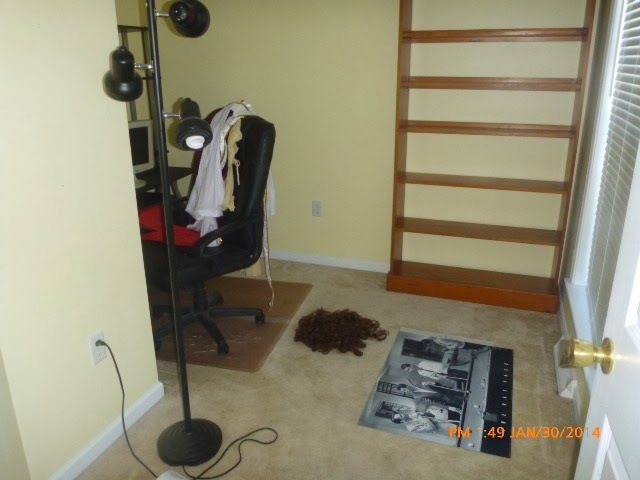 Please note the pile of hair on the floor. At first glance I was thinking it was dog hair from the two dogs that currently reside on the premises... but then I remembered the homeowner happened to dress up like Buddy Christ for Halloween and sighed a deep sigh of OCD relief that it was simply the wig. You have officially survived your first home tour. Oh the plans I have for you.... it's all that keeps me sane as I tape another box shut. Moving? Never again ma'am (or sir) never again. Oh my gosh. I want to be there planning painting with you! A blank slate - so exiting!! So, where did this bachelor jet off to? Do you have his number? Can't wait to see the after pictures! this cracks me up. haha alissa - her brother! your commentary was the best. This was too funny! And a crib? Is there some baby planning going on? 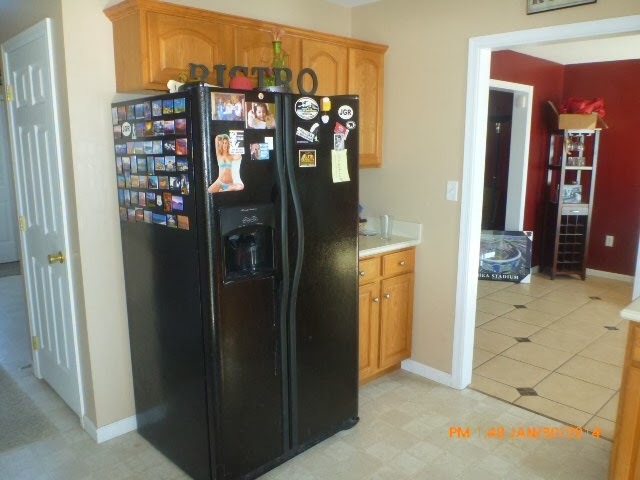 I especially love the fridge...thats the best!! oh the things this house has seen lol!!! It's a great house- can't wait for you to put your touches all over it! !